Above is a photograph of the Dudley Gatewood house as it appeared around 1938. The image and map were kindly provided by Pittsylvania County, Virginia, historian Robert D. "Danny" Ricketts. While the image dates from 1938 the sketch represents an 1890 survey of the 760-acre Gatewood tract of land. In 1938 the house was occupied by R. J. Cheek. The house was located less than a mile south of the North Carolina/Virginia state line and to the east of what was then the Yanceyville Plank Road. The house was on the Dix Ferry Road, which today is called the Walters' Mill Road. Note that the survey shows at the top right "Walters and others." Azariah Graves Walters owned 1,269 acres in that area. Walters built a mill on Hogan's Creek near its confluence with the Dan River. In 1791, President George Washington spent the night in the Dudley Gatewood house, which now resides in Hillsborough, North Carolina. See Missing Gatewood House. 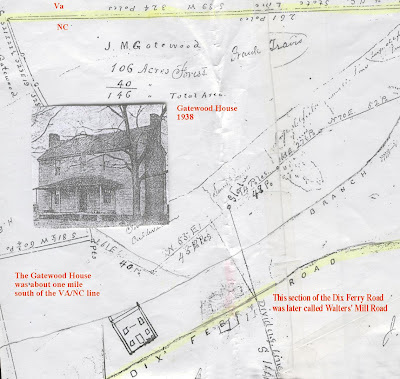 At one time the George Carter family owned the farm on which the old Gatewood house was located. The Carter family has substantial holdings in the Gatewood/Shady Grove area of Caswell County, North Carolina. The Dix Ferry apparently was located on a portion of the Dan River that flowed through Virginia. Note the waterway labeled "Branch" that has an arrow pointing northeast. This is thought to be Andrews Branch which flows into Virginia and runs near the old Thomas Fearn house. Azariah Graves Walters owned land in both Caswell County, North Carolina, and Pittsylvania County, Virginia. 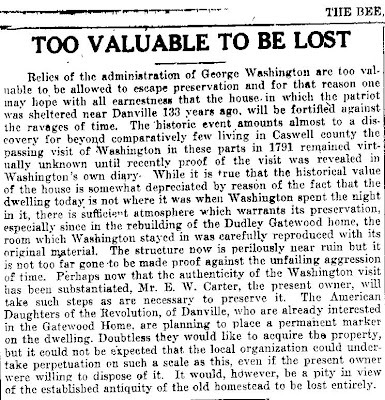 The tract in Pittsylvania County adjoining the Caswell Co tract was 1,050 1/2 acres and contained the old "Broadnax House". This house may have been the 18th century house of Thomas Fearn, who died in 1805. 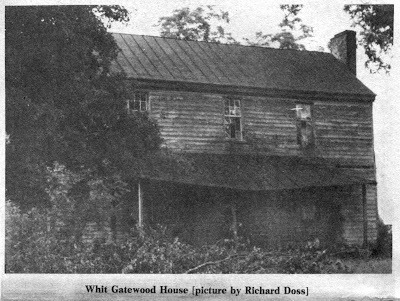 This photograph of the Dudley Gatewood (then called the Whit Gatewood House) appeared in the 23 June 1976 edition of The Caswell Messenger newspaper. Whit Gatewood is Robert Whitfield (Whit) Gatewood (1855-1918), great grandson of Dudley Gatewood. Whit Gatewood is believed to be the last member of the Gatewood family to own the house built by Dudley Gatewood. Above is a sketch by Robert D. "Danny" Rickets of President George Washington leaving Philadelphia on his 1791 Southern Tour. This is based upon a print Danny found in the National Archives. The six horses pulling the carriage traveled the entire 1,800 miles of the journey. Some publications refer to the famous Dudley Gatewood house as the Whit Gatewood house. Whit Gatewood is believed to be a descendant of Dudley Gatewood (possibly a great grandson) and may have owned the house at one time. 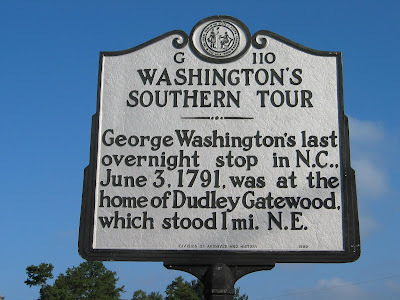 To obtain a poster showing that portion of Washington's trip in Caswell County, North Carolina, and Pittsylvania County, Virginia, go to Southside Books. For more photographs go to Dudley Gatewood House. The following photographs are courtesy of Robert D. "Danny" Ricketts. This the Dudley Gatewood house as it now stands in Hillsborough, North Carolina, as a Mexican Restaurant, Casa Ibarra. For more on the history of the house go to Dudley Gatewood.